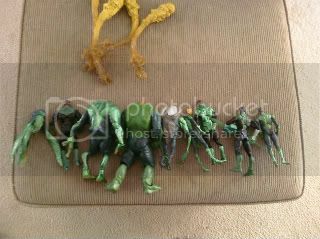 These are Zane's Green Lantern Corps. They are taking their naps. Then they will be well rested when they fly out to save several universes. Oh, and Parallax's arms are napping as well. Might I ask what squadron takes over while these guys rest? LOVE IT! I love that they're all stomach sleepers. Cute! My son has a collection on Iron Man figures like this... they also take regular naps. I guess rescue-heroing requires much napping. This made me smile so much. This was once my world! Our Lego's nap and even go to the corner when they are bad. Of course they are all sorted by color prior to hitting the corner!